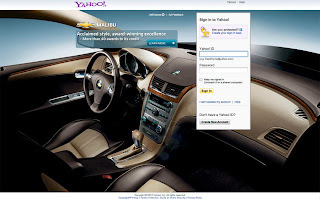 I ran across a very interesting ad buy from Chevrolet, or is it Chevy, this morning on Yahoo! Mail's login page where a Chevrolet Malibu interior is featured taking up 95% of the background of the page. It looks very similar to what the search site Bling does, but it is an ad not just background wallpaper. I thought I'd share this because it really is well-done and a very interesting ad buy that was something you can't ignore from the car you can't ignore. Plus I like how simple Chevrolet kept it with just one simple call to action: "Learn More". I'm certain the click-through-rates on this buy were very nice; though, it would be interesting to see if it was effective enough to cover what I'm sure was a very pricey ad placement. Nice to hear your blogs saying always correct and interesting post. Interesting breakdown. I hope I see all of you on that list one day. It's smaller than the Cruze, but the Sonic will share the larger sedan's powertrains, which could relieve the one of the biggest fears of subcompact buyers, sluggish performance. bike superstore for: Motocross, go kart parts Dirt Bike parts，ATV parts, UTV parts.